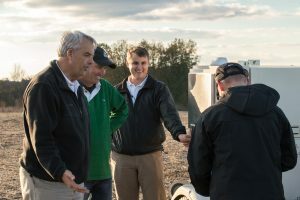 As precision agriculture technology has become increasingly important on my farm, soil sampling has become critically important to making good input decisions. But sometimes there just isn’t time to get all of the sampling done in time using traditional methods, and getting accurate fertility information is more important than ever. That’s why I was excited the first time I saw the machine that my team developed into the Falcon. The combination of a wheel and a probe that sample uniform cores at regular intervals stood out as a giant step forward over traditional manual sampling methods. Seeing Falcon take off is one of the highlights of my farming career. As a farmer I know how important it is to get accurate information. Falcon gets the job done so well I’m excited to have an opportunity to make a positive difference.